The Board denied institution of inter partes review of a digital rights management patent because the petition and supporting exhibits were too voluminous to permit a just, speedy, and inexpensive resolution of the proceeding. "The Director requires us to apply our trial rules 'to secure the just, speedy, and inexpensive resolution of every proceeding.' 37 C.F.R. § 42.1. No such proceeding could be secured with the record presented to us by Petitioner. . . . The [petitioner's expert's] declaration is 342 pages, includes voluminous information not relevant to this Petition, and contains numerous self-citations. The Petition includes sixty-one exhibits totaling 30,298 pages. Petitioner asserts that all exhibits are relied upon in the Petition. Fifty-one of the exhibits, however, are not cited in the Petition. The Office Patent Trial Practice Guide cautions that petitioners should 'avoid submitting a repository of all the information that a judge could possibly consider, and instead focus on concise, well-organized, easy-to-follow arguments supported by readily identifiable evidence of record.' The Petition widely misses that mark." The decision reported here is the latest in a series of PTAB decisions addressing accusations that hedge fund Hayman Credes Master Fund L.P. (under the name the Coalition for Affordable Drugs) has abused the IPR process by initiating IPRs against pharmaceutical companies while taking short positions on those companies’ stocks. The underlying motions cite 37 C.F.R. § 42.12 as a basis for imposing sanctions, including dismissal of the IPR proceedings. To track the PTAB’s rulings on the motions, click here, then click “create alert” at the bottom of the page. The Board granted the patent owner's request to file a motion for additional discovery concerning possible abuse of process by two real parties in interest. "[The] Patent Owner requests two non-public offering documents for [two named funds] both of which have been identified as real parties-in-interest in these proceedings. Patent Owner asserts that the documents will disclose the mandates of the funds, which likely will provide details as to the purpose of funds. In particular, Patent Owner asserts that the stated mandates will further explain a principal purpose of the funds, which is to take short stock positions against pharmaceutical companies. Patent Owner contends that this information will support its position that the filings of the Petitions are an abuse of process or an improper use of the proceeding under 37 C.F.R. § 42.12. . . . In light of the narrowly tailored request for specific documents, we grant Patent Owner’s request and authorize the filing of a motion for additional discovery." The court partially granted defendant's motion for supplemental attorneys fees under 35 U.S.C. § 285 for fees incurred defending plaintiff's appeal. "The Court previously determined that this case was exceptional. [Plaintiff] argues that this is insufficient to award fees for the appeal . . . . [W]hile it is true that an award of appellate fees is not automatic upon an unsuccessful appeal from a § 285 award, neither must the appeal be independently exceptional to justify such an award. . . . [Plaintiff] brought a meritless case and then extended that case, and [defendant's] defense costs, via the appeal. . . . [T]he Court awards Defendant its fees on appeal, because doing so is necessary to fully compensate Defendant for the defense of a meritless case. The Court does not find that the appeal was independently exceptional. To be clear, the Court is not here applying an automatic rule in which appellate fees must be granted if an exceptional case finding is affirmed on appeal . . . ."
Docket Navigator has a new feature available that makes it possible to create your own customized charts and graphs with just a few clicks! If you’ve ever wanted to create a chart showing how many motions of a certain type are granted in a specific court, or by a specific judge, that ability is here and within your reach. Docket Navigator’s new Analytics Motion Success page will take your filters (motion type, court, judge, etc.) and create a chart that allows you to quickly and easily display and analyze your results. The chart will display the grant rates in both numbers and percentages, and it also links back to the underlying data so you can read the court orders yourself. 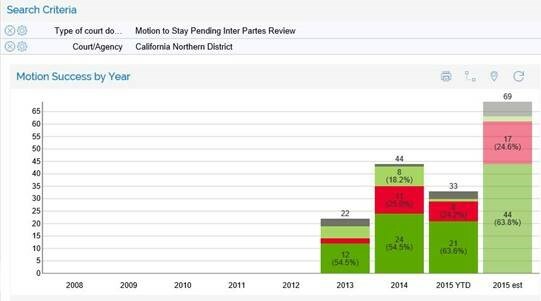 With Docket Navigator’s Motion Success chart, you don’t have to wait to have a PDF of the results sent to you. You can create your own PDF of the results on the fly, ready for sharing with your clients or litigation team in mere seconds! Check out the video for more detailed instructions. If you are not a current Docket Navigator subscriber, email us to request a free password to try out the Analytics! The court granted defendant's motion for summary judgment that plaintiff was not entitled to lost profits damages because plaintiff did not address market elasticity. "In constructing a hypothetical 'but for' market for the purposes of a lost profits analysis, '[a]ll markets must respect the law of demand,' which counsels that 'consumers almost always purchase fewer units of a product at a higher price than at a lower price, possibly substituting other products.' The undisputed record shows that during the relevant period [plaintiff's] product prices were between 194% to 819% higher than [defendant's]. [Plaintiff's expert] nevertheless assumes that [plaintiff's] products are perfect substitutes for [defendant's] products, thereby allowing all [defendant's] sales to be attributed to [plaintiff]. Critically, he did no serious investigation . . . to evaluate the validity of his assumption. . . . [T]he Federal Circuit held that where the price disparity between the infringer’s products and the patentee’s products was only 73 percent, the disparity was enough to dispel the notion that the patentee would have been able to capture all of the infringer’s sales. . . . [T]he price disparity between [the parties'] products is far greater, and customer testimony is clear that price sensitivity was a key concern in choosing a product." Reasonable royalty experts are frequently challenged for applying unreliable methodologies. Successful challenges are less common. Since 2008, U.S. district courts have issued 198 orders on motions in limine and motions to strike reasonable royalty expert reports for applying unreliable methodologies. The courts completely denied 88, partially denied and partially granted 66, and completely granted 32. To view the 32 granted orders, click here. To view all 198 orders, click here and remove the “Result of motion” filter shown at the top of the page. To limit the search result to a specific judge or court, add a filter shown on the left side of the page. The court denied defendants' motion to exclude the testimony of plaintiff's damages expert and rejected their argument that the expert's "market approach" methodology was unreliable. "According to Defendants, [the expert's] 'Market Approach' is not approved by the Federal Circuit. Rather, at best, the 'Market Approach' is a broad application of the first two Georgia-Pacific factors . . . [Plaintiff's expert] admits to not using the Georgia-Pacific factors in his analysis. In fact, [he] referred to the factors during his deposition as 'outmoded' (i.e., outdated, old-fashioned). . . . [T]he Federal Circuit has indicated that it does not require that witnesses use any or all of the Georgia–Pacific factors when testifying about damages in patent cases. . . . Defendants’ disagreement with [the expert's] use of the 'Market Approach' is better addressed on cross-examination and via their own damages expert." The court denied defendants' motion in limine to preclude plaintiff from presenting evidence of the PTAB's denial of defendants' petitions for inter partes and CBM review. "Defendants argue that [the PTAB's decisions denying institution of IPR and CBM review of a patent-in-suit] is irrelevant and highly prejudicial to the jury’s determination. . . .[U]nlike the situation in Interdigital Comm., Inc. v. Nokia, Corp., 690 F.3d 1318 (Fed. Cir. 2012), the petition for Inter Partes Review of the [patent-in-suit]] was instituted by [a defendant] and the PTAB expressly concluded in its decision 'Petitioner fails to demonstrate a reasonable likelihood of prevailing in showing the un-patentability of any of the challenged claims.'. . . The Court can and will instruct the jury on the appropriate law to apply to this case and can, if requested, further instruct the jury that different standards apply to these various proceedings (i.e., the PTAB’s decision denying Defendants’ petition for Inter Partes Review . . . and the PTAB’s decision denying Covered Business Method Patent Review with respect to [a patent-in-suit])." The court awarded defendant $5.9 million in attorney fees under 35 U.S.C. § 285 and partially rejected plaintiff's argument that fees for mock trials were unreasonable. "As for moot trial teams, such practice is entirely reasonable and typical. The Court, however, questions whether [plaintiff] should have to pay for three mock arguments. . . . [Plaintiff] does not provide this court with evidence to compare, but the Court can only assume that [plaintiff] did not conduct any mock arguments with outside professionals who might have brought 'the fresh perspective to the issue' as [defendant] did. . . . [C]onducting a mock oral argument and a follow-up one to address feedback from the first argument is entirely reasonable in a case of this complexity. It will, however, deduct . . . fees related to the third mock argument as unnecessary." The court denied without prejudice defendants' motion to stay pending their petition for inter partes review and found that the potential undue prejudice to plaintiff weighed against a stay where defendants filed their petition just before the deadline. "Moving Defendants' delay in petitioning for IPR could create at least some tactical disadvantage for [plaintiff] and a stay may unduly prejudice Plaintiff. While Plaintiffs status as a non-practicing entity reduces the prejudice it would suffer from a stay, there remains a potential for undue prejudice. The timing of Moving Defendants' filing suggests they may be seeking a tactical advantage, given they were aware of the prior art asserted in their IPR petition many months before filing the petition just three days before the statutory deadline." The court denied without prejudice defendant's motion to stay pending its petition for inter partes review and found the potential for undue prejudice to plaintiff weighed against a stay. "Defendant's delay in petitioning for IPR could create at least some tactical disadvantage for [plaintiff] and a stay may unduly prejudice Plaintiff. While Plaintiff's status as a non-practicing entity reduces the prejudice it would suffer from a stay, there remains a potential for undue prejudice." The court denied defendants' motions to stay pending a petition for inter partes review because the undue prejudice to plaintiff, lack of potential simplification of issues, and stage of the case weighed against a stay. "[T]he length of the inter partes review alone does not establish prejudice. Here, however, the delay is compounded by the fact that the [patent-in-suit] already had reexamination for eight years. . . . The timing of the stay request also indicates a tactical disadvantage. [Plaintiff] takes issue with [defendant] having waited almost a year after the filing of the case before requesting IPR. . . . It is unclear . . . why it took . . . 8 months after [plaintiff] disclosed its asserted claims and preliminary infringement contentions to file the IPR petition. . . . [Defendant's] nearly one-year-long delay was unreasonable. . . . [Plaintiff] maintains that the issues will not be simplified because [one defendant], who is not a party to the IPR petition, will not be bound by the PTO’s determinations of patent validity. The Court concurs with the Northern District of California that '[t]his is a real concern.'" The court denied defendants' motion for a continued stay pending inter partes review after the PTAB instituted review of only one patent-in-suit. "The [granted] petition only addresses three out of the eleven asserted claims in the case, therefore there is no reason to allow the remaining claims to 'languish' unresolved during the IPR process. Further, the claim terms in the [patent under review] will not significantly assist the Court in interpreting the [other patent-in-suit]. . . . Even with the delay of waiting for the PTAB’s institution decision, this case can still go to trial by the end of the year, resolving all of Plaintiff’s claims well before the PTAB makes a final determination on the [patent under review]. Especially since Defendants are not even parties to the IPR petitions, and are not estopped from bringing the same arguments, the Court finds that fairness weighs in favor of Plaintiff to resolve its claims in this forum." The court granted defendant's motion for judgment on the pleadings that four claims of plaintiff's patent for voice control of a computer were invalid for lack of patentable subject matter and found the claims were directed to an abstract idea. "The [patent-in-suit] describes a method and apparatus that 'uses oral input, natural language based rules, associative search and tabular data structures to provide an easily learned means for controlling a digital computer.' . . . [Plaintiff] also emphasizes that the patent is directed to using the human voice to control a computer using natural language. . . . The present patent is like that in [Ultramercial, Inc. v. Hulu, LLC, 772 F.3d 709, 714 (Fed. Cir. 2014)] in that it is directed to an abstraction; its disclosure of the use of a human voice to control a computer has no tangible or concrete form. Like Ultramercial, the claims contain some limitations, such as the use of a microphone and word recognition software, but these are not novel inventions. . . . The [patent-in-suit] does not simply perform a pre-existing business practice on the internet, but neither does it solve a business problem created by internet commerce." CBM review is available only to a party charged with infringement of a CBM patent. To qualify, the patent must be directed to a financial product or service but not a technological invention. Of the 213 CBM proceedings in which the PTAB addressed these issues, 191 (90%) resulted in a finding that the challenged patent satisfied both requirements. Only 6 (2.8%) resulted in a finding that the challenged patent was directed to a technological invention. To view the entire report and access the underlying data, click here. The magistrate judge recommended granting defendants' motion for judgment on the pleadings that plaintiff's portable device media delivery patent was invalid for lack of patentable subject matter and found that the claims were directed toward an abstract idea. "Contrary to [plaintiff's] position, the Supreme Court did not 'delimit the precise contours of the "abstract ideas" category' in [Alice Corp. Pty. Ltd. v. CLS Bank Int'l, 134 S. Ct. 2347 (2014)] and instead left the lower courts to develop the category on a case-by-case basis. [Plaintiff's] interpretation of the law is overly narrow, and the distinction [it] attempts to make between 'business methods involving fundamental economic practices' and 'longstanding practices' boils down to semantics. . . . The Court finds that delivering selectable media content and subsequently playing the selected content on a portable device is a longstanding commercial practice and is therefore abstract." The court partially granted defendants' motion to enforce a prosecution bar against plaintiff's expert who prosecuted a patent involving the relevant technology after receiving defendants' confidential information. The court ordered the expert to return all confidential information and excluded the expert's testimony but did not impose sanctions against plaintiff or plaintiff's counsel. "[Plaintiff's expert] must return any [defendant] designated information and may not use that information for any purpose. In addition, any testimony from [plaintiff's expert] is excluded from this action. . . . [Defendant] points out the difficulty in separating out confidential information in testimony, and the unreasonable lack of trust such a violation fosters. . . . While there is no doubt [plaintiff] will be challenged by the exclusion of any [the expert's] testimony, this is a challenge of its own making, and in any event, [plaintiff] can still retain another expert. . . . [Plaintiff's expert's] failure to comply with the protective order may not have been substantially justified, but the court cannot say that [plaintiff] or its counsel should be held to account for it. Under such circumstances, an award of expenses would not be just." The court granted defendant's motion to stay a recently transferred case pending inter partes review and rejected plaintiff's argument that defendant was hijacking the litigation because only 2 of 11 patents-in-suit and 3 of the 22 claims were subject to review. "The patents-in-suit come from three patent families, and . . . there is a 'similarity of inventive disclosure' in the patents, which all 'share similar specifications,' and all of the asserted claims share the same 'key inventive aspect.'. . . As a result of the significant overlap among the patents-in-suit, and between the claim elements of the claims under review in the IPRs and those found in each of the remaining 19 claims, the Court agrees with [defendant] that the IPRs are likely to simplify the issues in this case, regardless of the specific outcomes of the IPRs. Conversely, denying a stay entirely, or granting a stay only as to those patents and claims under IPR, could result in costly inefficiencies for the parties and the Court by introducing a need for certain portions of discovery and motion practice to be redone after the completion of the IPRs." The ALJ recommended that a general exclusion order be issued following a violation of section 337 by defaulting/non-participating respondents' toner cartridges. "Not only would a GEO prevent circumvention of an exclusion order limited to the infringing products of specifically named entities, but the evidence also demonstrates that there is a pattern of violation of section 337 such that it is difficult to identify the source of infringing products. . . . [F]oreign aftermarket toner cartridge manufacturers have the capacity to replicate their operations in the form of a new business in a matter of months. . . . [I]n approximately two months' time, [personnel from a respondent who was terminated through a consent order] (a) left [the terminated respondent], (b) created a toner cartridge manufacturing facility in Jiangxi, China, which could reportedly produce about 300,000 toner cartridges per month, (c) created a global sales and marketing center in Sanxiang, Zhongshan (China), and (d) created a U.S. importer and distributor for [a new group of respondents'] toner-cartridges. . . . The rapid creation of [a new group of respondents] demonstrates how quickly a new business can spring to life and carry on the same infringing activities as a company named in a limited exclusion order, and is an example of how key management personnel of a named company could circumvent an exclusion order limited to the products of that company by leaving to start a new company." The court denied plaintiff's motion to modify the court's order limiting the number of asserted claims because of plaintiff's previous lack of cooperation. "[Plaintiff's] request that the Court modify its prior decision relating to reduction of asserted claims is denied, given Defendants' representations that [plaintiff] refused previously to consider any proposal to reduce the number of asserted claims and [plaintiff's] failure to propose any reasonable alternative prior to the Court making its determination." Following a jury trial finding plaintiff lacked standing to assert the patents-in-suit in a related case, and a finding in that case that defendant was entitled to an award of attorney fees, the court granted defendant's motion for attorneys' fees in the instant case. "'[T]o be "final" for [issue preclusion] purposes, a decision need not possess "finality" in the sense of 28 U.S.C. § 1291,' which establishes the jurisdiction of the courts of appeals over final decisions of the district courts. Rather, "the proper query . . . is whether the court’s decision on the issue as to which preclusion is sought is final." . . . Here, [the other] court found, in a reasoned opinion, that the case is 'exceptional' and granted the defendants’ motions for attorney’s fees pursuant to 35 U.S.C § 285. . . . Because the only issue left unresolved is the amount of reasonable attorney’s fees that the defendants incurred, the [other] court’s determinations that the case is exceptional under § 285 and that fees are warranted are sufficiently firm to be accorded conclusive affect. . . . [T]hat Plaintiff might appeal the [other] court’s decision does not affect whether collateral estoppel applies." In granting the patent owner's motion to amend several challenged claims, the Board rejected the petitioner's argument that the patent owner did not address all known prior art. "While not required to prove that the claims are patentable over every item of prior art known to a person of ordinary skill, [the patent owner] is required to explain why the claims are patentable over the prior art of record. In addition, [the patent owner]'s duty of candor to the Office requires that it discuss any relevant prior art not of record but known to it. . . . [The petitioner] identifies three references in particular . . . [However], the three references cited by [the petitioner] are relevant to [the patent owner's] teaching away argument, not any issue newly raised by the Motion to Amend. As [the patent owner] points out, [the petitioner] does not allege that any of the proposed substitute claims are unpatentable over a combination of references that includes [the three prior art references at issue]. We consider the present case to be distinguishable from that of [ScentAir Tech., Inc. v. Prolitec, Inc., Case IPR2013-00179, slip. op. at 27–30 (PTAB June 26, 2014) (Paper 60)], and decline to deny the Motion for failing to address all relevant prior art." The court denied plaintiff's motion for attorneys' fees under 35 U.S.C. § 285 and rejected plaintiff's argument that defendant's infringement claim was baseless because it failed to contact the inventor before filing suit. "[Plaintiff's] argument on this basis relies in large part on [defendant's] failure to contact and interview . . . the inventor of the [patent-in-suit] until after it had threatened [plaintiff] with litigation. . . . [The inventor] ultimately rendered an opinion that [plaintiff's] product did not infringe on [defendant's] patent. . . . [The inventor's] interpretation of the [patent] is undoubtedly entitled to weight, but [he] is not a patent attorney or even an attorney. . . . [Plaintiff] does not cite any authority demonstrating that [defendant] was required to solicit the interpretation of the patent's inventor before initiating a patent infringement claim, nor is this Court willing to impose such a stringent requirement on patent holders." The court granted plaintiff's motion to exclude the testimony of defendant's damages expert regarding a reasonable royalty as unreliable where the expert relied on noncomparable third party license databases and industry reports. "The patents relied on by [defendant's expert] through the RoyaltySource database are not comparable to the patents-in-suit. Furniture, enzymes, spider silk, and the like have no bearing on the royalty estimations in this cami-bra case. [The expert's] reliance on incomparable patents is flawed and unreliable. . . . [Plaintiff] contends since it is impossible to determine from [a report based on the same data as the RoyaltySource database] what licenses are used to arrive at the rates provided, or to determine the terms of those specific licenses, [the expert] is unable to prove such data is comparable to the hypothetical licenses at issue in this lawsuit. . . . [T]he Court agrees with [plaintiff]. . . . Since [an industry] report covers generic evidence, rather than a specific product line such as bras, the evidence is not reliable. The Court takes issue, for instance, with how there is no way of knowing how many licenses are used to generate the data or details about the licenses." The Board granted institution of covered business method review of a data security patent and rejected the patent owner's argument that the challenged patent was not directed to a financial product or service. "Patent Owner [argues] that the Petition does not cite to 'any single word in any single claim' that is directed to a financial product of service; none of the prior art cited by Petitioner is directed to a financial product or service; and Petitioner does not cite any examples of actual financial products that employ the method of the claims. . . . [A]t least one claim claims a method for performing data processing or other operations that are at least incidental or complementary to the practice, administration, or management of a financial product or service. . . .The Specification discloses that protection attributes are used to protect against unauthorized access of a data portion in a database and that banking is a field where protection against unauthorized access to databases that are used for administering and storing sensitive information is desired." The court granted defendant's motion for attorneys' fees under 35 U.S.C. § 285 because plaintiff failed to disclose a prior art software program later determined to be invalidiating prior art in a reexamination proceeding. "[Plaintiff] wrongly argues that 'inequitable conduct cannot be the primary basis for an attorney’s fees award . . . .' If a plaintiff knows that its patent would not have issued but for the intentional omission of material information during prosecution of the patent, then the plaintiff knows that the patent is invalid and acts deceitfully in suing for its infringement. . . . In light of [the inventor's] declaration that [a prior art] program was key to his conception, the failure to identify it and produce it violated the good faith requirements of [Local Patent Rule 3.2.b]. Early disclosure of this reference in accordance with the rules could have substantially impacted and shortened the litigation and the reexamination proceedings." The court granted defendant's motion for summary judgment that plaintiff's incentive program patent was invalid for lack of patentable subject matter and found that the patent lacked an inventive concept. "Nothing in the claims purports to improve the functioning of the computer itself, and the computer-related elements of the claim add nothing that is not already present in the steps of the claimed system and methods, other than the speed and convenience of basic computer functions such as calculation, communication, and the display of information. . . . [Plaintiff] relies on the presumed volume of information and speed required in large, commercial incentive award programs, which a human armed with only a pencil and paper could not keep up with. But the claims apply to incentive award programs without regard to their size, and there is no room for doubt that if the incentive program were small, humans could perform each of the tasks that the claims assign to computers without the need for processing assistance." The court denied without prejudice defendant's motion to modify a protective order to preclude plaintiff from using "[defendant's] confidential information, and more specifically its ANDA, to determine if [defendant] violated [plaintiff's] patent not already named in the complaint." "This appears to be an issue of first impression. . . .The Court will not issue a blanket rule prohibiting [plaintiff] from reviewing [defendant's] confidential information to determine if a new patent should be added to the case. . . . The term limiting the use of confidential information to 'this action' is broader than [defendant's] proposal seeking to limit the use to only the 'claims and defenses' already asserted in the complaint. . . . [A] party may use confidential information to add a new patent to a case, provided that the new patent is sufficiently related to the pleaded claims and defenses that an amendment would be permitted under the applicable Rules of Civil Procedure."